The conclusion of this post is pro Trump, but that is not an indication of bias. I am reacting to news that I think is incorrect, and I'm trying to correct it. Trump is actually ahead in one, and I'm screenshotting this because they might remove it later for being too Trumpy. The second set of polls are the same polls, with older (weekend focused) polls removed. Weekend polling is known to favor democrats. Now that I'm writing this, I'm not sure it's overly important. Oh well. I picked out the ABC news tracking poll randomly. In the 4-way race it has Clinton +4. It discloses the following if you read enough "Partisan divisions are 37-28-29 percent, Democrats-Republicans-independents." 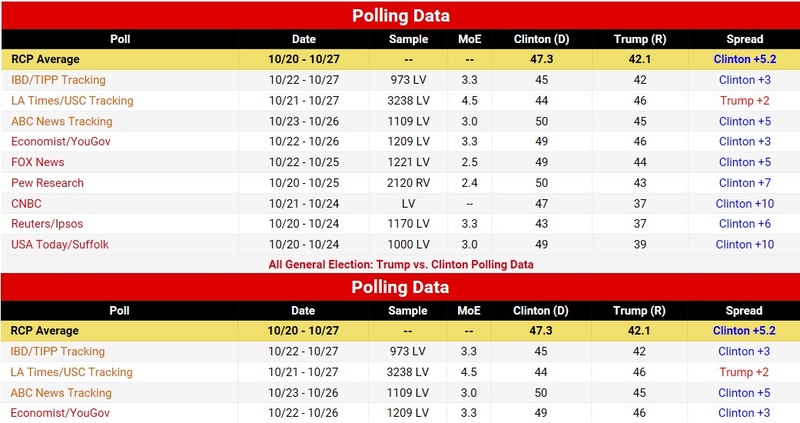 Which means that the 9 point lead of D to R in the sample (that they achieved on purpose) is a 3 point lead in reality, and docking 6 points from the +4 Clinton gets, winds up as a +2 for Trump. That math is an oversimplification of course, but if looks like the true winner of this poll is indeed Trump. I went ahead and did the same math for the first poll (Clinton +3) and weighing it back to reality, I get Trump +.2%, in a 4 way race. I suspect Trump will have an easier time getting last minute votes from Gary Johnson than will Hillary. I'm not cheerleading Trump, I'm just telling it like I see it.